I chose the BMus at City as it gave me the opportunity to be flexible about the modules I take. Aside from the few core modules in my first year, I have total control over what I learn, rather than being 100% focused on one subject (e.g. Performance). I chose City partly due to its location, in the heart of London, and also due to its vast range of modules and facilities. As a percussionist I was also keen to have access to more instruments than I can shake a stick at! The best thing is the ability to get networking with London's vast array of groups and societies. Also it's a great place for meeting up with people, plenty of places to go, things to see and do. My greatest achievement whilst at City has to be my role as principal percussionist in The Moonflower, an Opera production which took part in the Tête-à-Tête Opera festival. 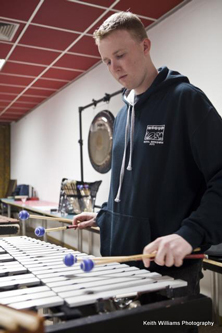 My involvement started simply by discussing percussion with its composer, who taught my first-year composition module. Just ask. If you have any questions, there is a whole crowd of people both inside and outside the department (including students from other year groups - we were all Freshers once too!) who would be happy to answer any questions you might have.